This edition of the International Review of the Red Cross (the Review) explores complex and wide-ranging issues pertaining to migration and displacement. Migration and internal displacement are not new. 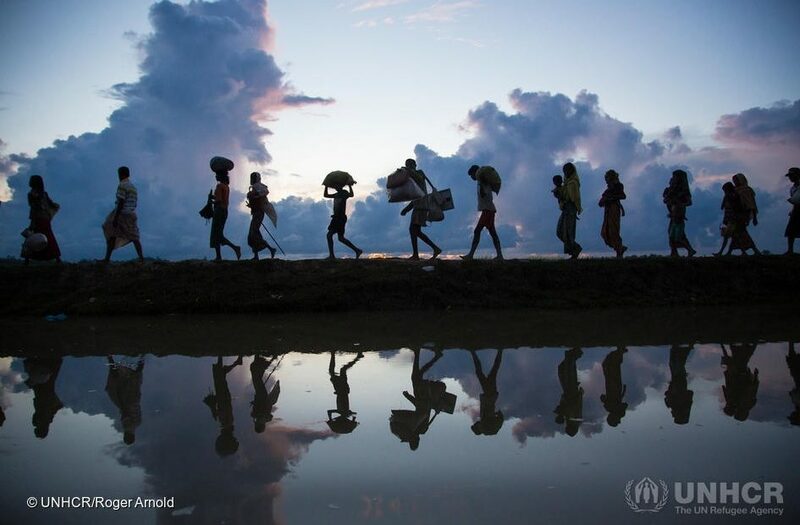 Throughout history, people around the world have fled or left their homes because of conflicts, persecution, poverty or simply in pursuit of better opportunities. Migration can be voluntary or involuntary. Often it is more complex than that binary paradigm—it is a combination of choices and constraints that may lead some to leave, while others stay behind. While en route or at the destination—be that within one’s own country or across one or several State borders—a person can be faced with many difficulties. These range from basic immediate needs, needs that surface after a certain period of time as they find themselves in a situation of protracted displacement to legal issues with local authorities. This edition of the Review examines these and other related questions, providing insight into different humanitarian approaches to the needs and vulnerabilities of migrants and internally displaced persons (IDPs). The ongoing migration and displacement crises inevitably demand a response. As noted in the editorial, the never-ending string of images showing uprooted people on a scale not witnessed since the Second World War raises several questions: what brings people to flee their homes and expose themselves to so many risks; what can be done to help them resume their normal lives? The efforts and activities of humanitarian actors play an important role in this regard, as is explored in this edition of the Review. International responses, however, should go beyond humanitarian ones. Migration and displacement are also a concern of global governance in which States have the primary responsibility. To give voice to those who suffer the humanitarian consequences of migration and displacement, testimonies from families of missing migrants in Zimbabwe are featured in this edition of the Review. The specific heaviness felt when loved ones are missing is portrayed in these testimonies. Those left behind are confronted with a sense of loss that arises from lack of clarity of the whereabouts of their loved ones and uncertainty as to whether they are alive or dead. This concept—known as ‘ambiguous loss’—will also be discussed in an upcoming issue of the Review on The Missing, due out later this year. A photo gallery of the internally displaced in northeast Nigeria provides a glimpse into every-day struggles of the displaced. The portrayal of IDP camp, families looking for their missing relatives, vulnerable children and others are only a few of numerous examples existing worldwide of what displaced persons go through in pursuit of safety. The importance of perspective in regard to displaced persons is explored by Elena Isayev as she underscores why it is imperative to shift perceptions and see displaced persons as potent agents, rather than to simply view them as victims in a foreign place. She emphasizes that not understanding the potency of their agency means ignoring the emergence of new forms of collective action and governance. As Ahmad Al-Rashid, a former IDP in Syria, asylum seeker in Iraq and refugee in the United Kingdom expressed, ‘people on the move are experts by their experience’. They should, he stressed, be heard and included in international debates that are about these issues. The power of language in today’s fast paced world is explored by Faye Donnelly. As she says in her contribution, ‘the ways in which different groups of people are spoken about constitutes a dividing line between life and death’. She examines how protection of migrants, refugees and IDPs is framed and how the dominant responses of States have been reliant on the language of security, highlighting that ‘language games of (de)securitization are not identical when it comes to protecting different groups’. In conclusion we read that ‘a richer conceptualization of acceptance and love … may help us to move … towards long-term solutions’ and to bring hope that human beings can accept that we are all equals. Other articles in this edition explore a States-oriented perspective towards migration and displacement. One of the key takeaways of the 2017 Forced to Flee conference is that migration and the movement of populations is not something new. As noted in the ensuing report, history can provide us with an overview of causes triggering mass migration flows in the past—such as persecution, political oppression, armed conflicts—as well as the respective responses to these crises. It is further asserted in the report that these history lessons should better inform current debates and introduce different perspectives into public discourse which should, in turn, be de-politicized and focused more on humanitarian norms and human rights. Policy-makers should therefore decide how to respond to mass population movements; unilateral action is not enough. It was concluded that this is why the New York Declaration is important as it prompted a conversation on a high decision making level, and envisioned the adoption of two Global Compacts in 2018: Global Compact on Refugees and Global Compact for Safe, Orderly and Regular Migration. On a regional level, Adama Dieng explores the value of the Kampala Convention for the Protection and Assistance of Internally Displaced Persons in Africa. The Convention can be taken, in his view, as an example for the international community to use in any potential future endeavor to develop an international legally binding instrument for protection of IDPs. As he notes, the Kampala Convention has been hailed as a great achievement. It took cross-cutting regional problems and tailored obligations to help frame the necessary response. The success of the Kampala, with the shortcomings in practice have been examined by the ICRC in its report on the stocktaking exercise on translating the Kampala Convention into practice. Since the so-called ‘refugee crisis’ hit Europe in 2015, there has been a lot of discussion on the obligations of ‘transit countries’, as well as on the applicability of the 1951 Refugee Convention to those that refrain from seeking asylum in countries they pass through on the way to their final destination. Pavle Kilibarda takes the case of Western Balkans to examine what the legal obligations of transit countries are under international refugee law. He maintains that in times of mass influx, international refugee law remains applicable in transit countries. One indisputable obligation of States under international law is the prohibition of refoulement—described in the ICRC note on non-refoulement as ‘prohibit[ing] the transfer of a person from one authority to another when there are substantial grounds for believing that the person would be in danger of being subjected to violations of certain fundamental right’. This principle can be found in human rights law, international humanitarian law (IHL) and refugee law. The ICRC note presents how certain aspects of the principle have been interpreted by States, courts, human rights treaty bodies and expert organizations. This topic was also explored in a blog post on the topic of five key points of the principle of non-refoulement in the migration context. To complement the discussion on protection offered under different branches of international law, Helen Obregon Gieseken develops an overview of how IHL provides legal protection for migrants finding themselves in countries affected by international and non-international armed conflicts. Notably, IHL offers protection to all migrants as civilians against the effects of hostilities and when they find themselves in the hands of a party to the conflict. Certain rules relating to the movement of migrants, family unity and missing and dead migrants are examined more closely. The impact of IHL violations and the conduct of hostilities more generally have on displacement is the subject of an ICRC research project, the results of which will be featured in a forthcoming Review article. Broadly speaking, the research concludes that respect for IHL may likely contribute to mitigating the phenomenon of and length of displacement. To unpack the different humanitarian responses and provide a humanitarian perspective on migration and displacement, this edition looks at how different humanitarian organizations protect and assist migrants and IDPs. In his interview, Filippo Grandi, UN High Commissioner for Refugees, outlines some of today’s significant forced displacement challenges and highlights the importance and progress of the two Global Compacts. He stresses that the Global Compact on Refugees is aimed at reinforcing the existing doctrine and finding better ways of responding to refugee crisis. The Migration Compact, in contrast, focuses on how to have better migration governance. He underlines the importance of solidarity in providing responses to forced displacement and how that the two Global Compact processes are important because the ‘protection crisis’ has been followed by the ‘crisis of solutions’. In their pieces, Vicki Mau of the Australian Red Cross, Debbie Busler of the British Red Cross and Arnaldo Ponce and Norma Archila of the Honduran Red Cross discuss the perspectives of their respective National Societies towards different contextual challenges related to migration and displacement. Mau notes how important it was for the National Societies and other components of the International Red Cross and Red Crescent Movement (the Movement) in Asia Pacific to develop a network that coordinates and works collectively in addressing the needs of migrants at all points of their journey in the region. Busler reflects on a specific context of the ‘Jungle’ refugee camp in Calais, France and the British Red Cross’s response to the young migrants’ transfer to the United Kingdom. Ponce and Archila provide an overview of the Honduran Red Cross’s assistance and protection activities in relation to vulnerable migrants, notably the Corinto module and the subsequent management of the Returning Migrant Assistance Centre in Omoa. The discussion on migration and displacement in the Movement and the International Federation of Red Cross and Red Crescent Societies’ (IFRC) more specifically is further developed in the opinion note by Sebastien Moretti and Tiziana Bonzon. They reflect on the development of IFRC approach to migration and displacement and the emergence of the 2009 IFRC Policy on Migration. In her article, Stéphanie Le Bihan talks about the ICRC approach in addressing the protection and assistance needs of migrants. She stresses that the response is led strictly by migrants’ humanitarian needs. She further notes that these needs could be greatly reduced if States abide by their obligations and commitments under international law, which should be reflected in their respective policies. Turning to the topic of urban displacement, Angela Cotroneo acknowledges that as the world is urbanizing so too is internal displacement. She discusses three key challenges that humanitarian actors are faced with when developing effective responses with regard to IDPs: working on identifying and reaching IDPs in urban settings, addressing their urgent protection needs and concerns, and supporting their local integration. She further stresses that IDPs, as well as host communities, more often than not live with a multitude of interlinked daily concerns (including a lack of basic necessities, access to livelihoods and employment opportunities, education, healthcare, adequate housing, as well as physical insecurity and the risk of overburdening infrastructure with a sudden population influx). These concerns, she maintains, need to be taken into account when designing adequate and effective humanitarian response and reducing the impact on urban host communities. How rapidly humanitarian organizations, specifically those that work on assisting refugees, IDPs and migrants, need to adjust to the changing environment is explored by Ben Hayes. He assesses some of the challenges in the humanitarian sector in relation to data protection, looks at how it is responding in terms of policies and practices and provides some outlook on the legal and ethical obligations of the sector. In their article, Kristin Bergtora Sandvik, Katja Lindskov Jacobsen and Sean McDonald discuss how humanitarian organizations are expected to innovate as different phenomena (armed conflicts, disasters, epidemics, poverty, famine) constantly test and challenge humanity and with it the humanitarian sector. This selected article, not related to the main theme of the edition, explores possible challenges to the ‘do no harm’ principle that come with ‘humanitarian experimentation’. The authors specifically focus on three cases of humanitarian innovation in their analysis: biometrics, data modelling and cargo drones. This was also explored in their blog post on humanitarian experimentation. This edition also features ICRC policy paper on immigration detention and the joint ICRC and UNHCR aide-memoire, an operational guidance on maintaining the civilian and humanitarian character of sites and settlements. An update on new case studies in How Does law Protect in War? Online is also provided, along with a short summary of new thematic highlights. Two book reviews are included as well. Catherine-Lune Grayson reviews Jennifer Hyndman’s and Wenona Jiles’ book Refugees in Extended Exile: Living on the Edge and Margherita D’Ascanio provides a review of The Arms Trade Treaty: A Commentary by Andrew Clapham, Stuart Case-Maslen, Gilles Giacca and Sarah Parker. The issue closes with the usual overview of new publications in international humanitarian law and on the International Committee of the Red Cross. The prohibition of the transfer of a person from one authority to another when there exists reasonable grounds for believing that the person would be in danger should be an indisputable obligation for the States. This principle really needs to insert in human rights law, international humanitarian law (IHL) and refugee law.